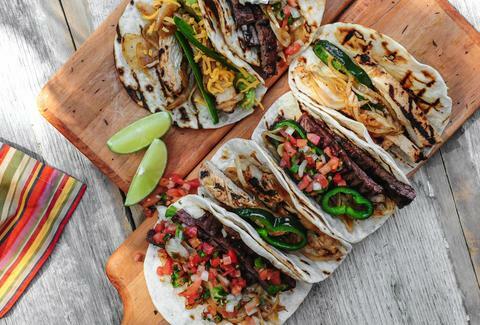 New to the taco game, “The El” is having cheeky fun with a menu of novelties and twisted-up classics. Who can resist the JB taco, a corn tortilla stuffed with spicy ground meat and yellow cheese, entirely deep-fried, and topped with crunchy iceberg and onions? It’s the tangy JB sauce, mimicking a certain burger drive-thru fame, that kicks it up. Yeah, you know the one. So what if they ripped off the signature creamy green sauce from Ninfa’s? It’s all in the family. This Houston institution has a handsome new double-decker location serving big-as-your-face tacos and sizzling fajitas to late-night Montrose revelers. For your midnight fix, grab the ground beef crispy taco with extra yellow cheese (you’ll need it to soak up the booze) and spicy salsa. Spring for the fish and crab soft taco if you still have room. Fresh from Missouri City comes a second outpost of this family-favorite housed in former Coppa location on Washington Ave. These dudes have the benchmarks down: spicy fresh salsa delivered warm, thick, nutty chips that hit the table hot, great guac, and knock-your-socks-off frozen ‘ritas. Save a little room for the ridiculously tender chicken tacos al carbon rolled in house-made flour tortillas, or the beefy smoke-tinged skirt steak tacos. 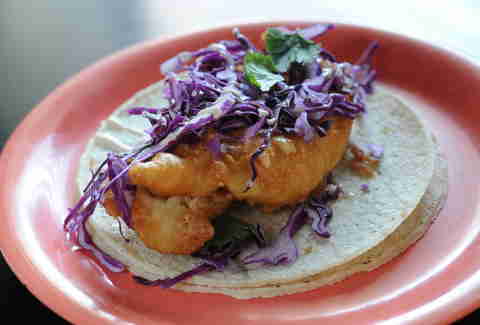 Houston’s fish taco pioneer still gets it right with crispy fried white fish or grilled shrimp, a shower of red cabbage, cilantro, and jalapeño-cilantro cream sauce (ask for it on the side) double-wrapped in corn tortillas. 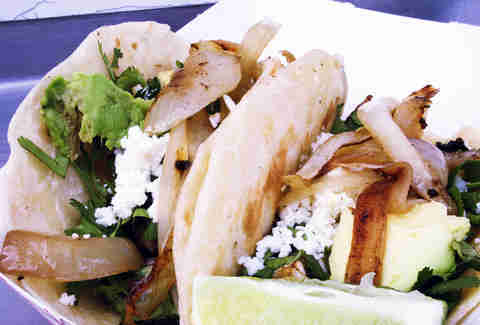 There are lots of locations now so find “your” Berryhill for Baja fish taco bliss. 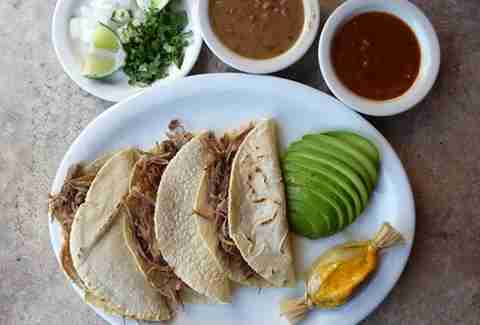 At weekend brunch, build your own street tacos, starting with (our rec) chunky pork carnitas. Pile on the cheese, avocado, pico de gallo, peppers, and multiple hot sauces for a fiesta en la boca. 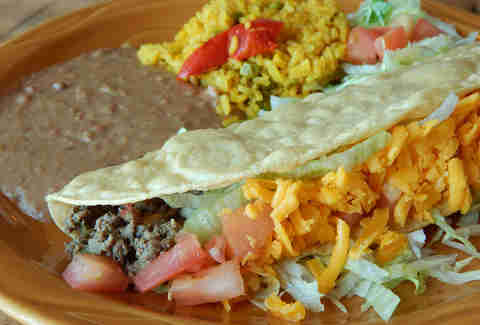 Tacos here are served on thick, nutty house-made corn tortillas. 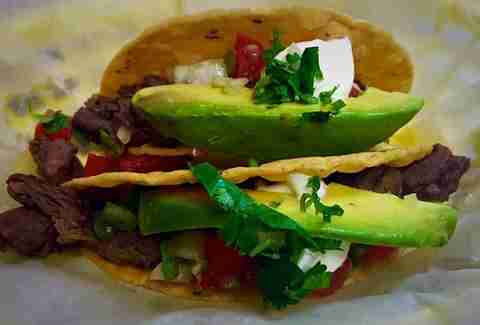 Velvet Taco, which has a cult following in Dallas with a location also in Chicago, is opening its first Houston outpost at 4819 Washington Avenue this summer. Expect a worldly, late-night menu of tricked-out tacos like crispy tikka chicken and Thai basil, or Cuban pig with Gruyere cheese, shaved ham, peppered bacon, grain mustard, and house-cured pickles on a house-made crisp flour tortilla. The tacos from this truck are auténtico, and mere pennies -- they start at $1.50 and ratchet waaayyy up to $1.75 for El Ultimo on chubby flour tortillas. Pick your meat (regulars devour the chicharron y barbacoa), which gets topped with salsa verde, grilled onions, cilantro, white cheese, and avocado slices. This cool haunt by Chef Bryan Caswell and Robb Walsh touts beloved vintage Tex-Mex treats, like tender, slightly crackly homemade puffy tacos a la San Antonio. 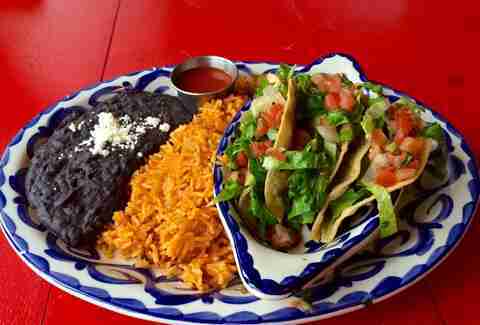 Choose from puffy shrimp tacos, ground beef, pulled pork, smoked chicken, or vegan guacamole and black bean. Nothing tops the limey, stout margaritas. Or the addicting avocado-tomatilla green sauce. 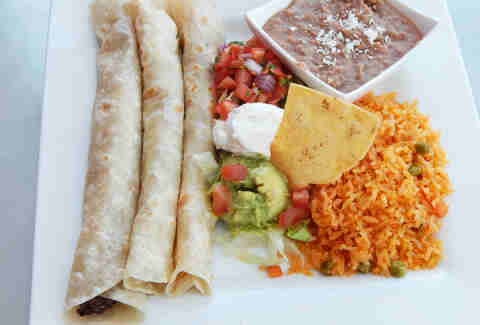 Or the house-made flour tortillas here -- except probably the sizzling beef fajitas Mama Ninfa made famous. 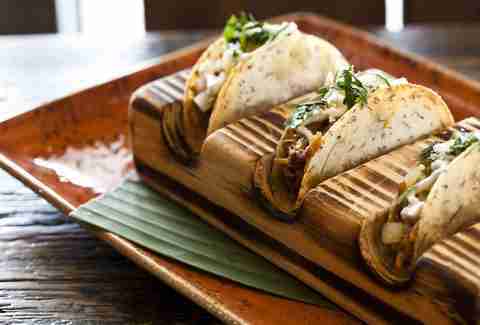 The tacos al carbon platter kills with smoky, tender beef charred to perfection and swaddled in plushy flour tortillas you’ll want to sleep in. Gracious service, generous portions, and fair prices keep this stalwart golden. 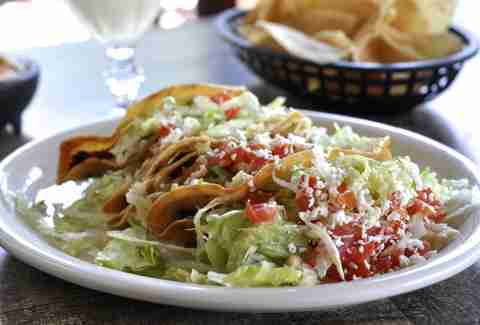 Molina’s still serves a throw-back puffy taco stuffed with savory pork carnitas, and topped with a blizzard of tomatoes, shredded iceberg, and queso fresco. These light, crispy taquitos made from fried taro root are small but huge in flavor. Stuffed with moist shredded pork filling & fresh pineapple, and drizzled with rich crema fresco, the overall effect is savory-sweet, and delicious. Here’s your chance to look adventurous at only $6 during happy hour. Priced just right for inhaling a half dozen, these magically fluffy, slightly chewy flour tortilla tacos (made in-house, of course) are on point. Definitely doctor up the chicken and barbacoa with all the toppings you can: cilantro, onion, salsa verde, avocado, and lots of jalapeños. 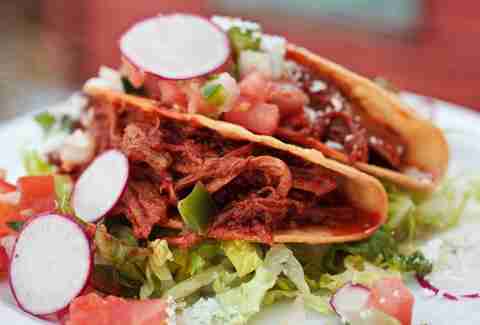 Sign up for $1 taco Tuesdays or happy hour, two tacos for $5. The tacos are on the smallish side so you’re going to want to get down on the al pastor, marinated pork with pineapple, onion, and cilantro; and the beer-battered fish taco with cabbage and chili aioli. This hipster joint also serves jalapeño poppers, street corn, Mexican cocteles, and infused tequilas. How suave. Roll up your sleeves. 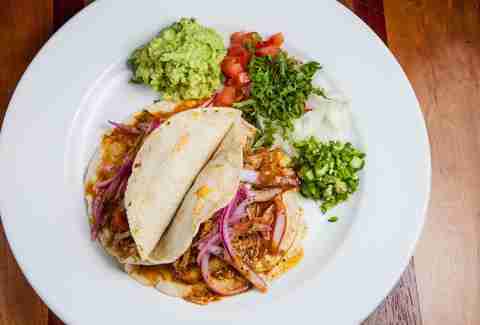 The beastly tacos de cochinita pibil, slow-roasted pork marinated in millions of spices and littered with pickled red onions, drip with flavor. Sides of fresh jalapeños, guacamole, pico de gallo, grilled onions, Mexican rice, and black beans are bomb. And both the incendiary house green salsa and the tomato salsa are as fresh and sassy as a well-deserved slap in the face.